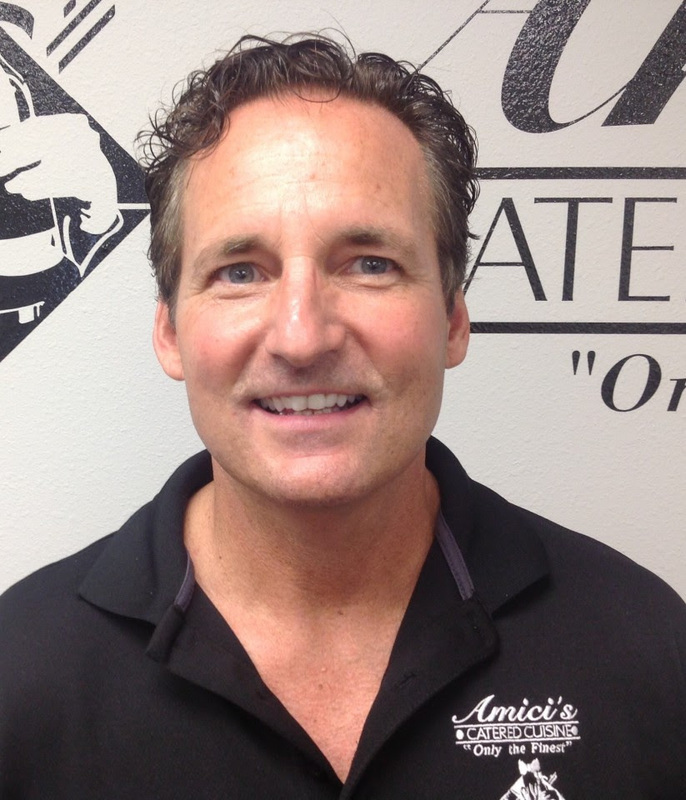 Please welcome our October 2014 Member Spotlight ... Mike Lamando with Amici's Catered Cuisine. Amici’s Catered Cuisine is an off premise catering company that provides high quality creative cuisine, elegant food presentations, and attentive service resulting in happy clients and a steady overall growth in business for over 30 years. Amici’s was originally opened in Palm Harbor in 1983 as a meat market, deli and catering business in a 900 square foot space and was named “Amici Prime Meats”. The retail business was phased out after 14 years but created a solid foundation for the smooth transition into a full scale catering business due to the development of customer trust and loyalty. In 1997 Amici’s moved to Oldsmar, in the middle of the tri-county Tampa Bay area, where their focus was strictly on growing the catering company. Amici’s Catered Cuisine recently expanded into a 10,000 square foot building purchased to improve efficiency, enable future growth and to better serve their clients. Owner Michael Lamando, a graduate of Florida State University, has a degree in Hotel and Restaurant management. He has been a member of NACE since 1998. Michael’s passion for food and service developed at an early age having grown up in New York in an Italian/Irish home. Michael emphasizes a family atmosphere in the workplace and surrounds himself with the best staff in the hospitality industry. Many employees have been working at Amici’s for over 15 years. Even though the majority of his time is spent on continually improving his business, he always finds time to give back to the community. Over the years, he has contributed to a variety of fund raisers and charities. On November 16, 2014, Amici’s is honored to be donating their catering services for “Mission I Do” at Old McMickey’s farm in Odessa. “Mission I Do” is a 25K Dream Wedding Gift for a wounded veteran and his bride to be. Amici’s Catered Cuisine is a preferred award winning caterer at over 100 banquet and reception halls in the Tampa Bay area. They specialize in wedding receptions, casual business meetings, fully staffed corporate events, Bar/Bat Mitzvahs, Quinceaneras , cocktail parties, grand openings, company picnics, birthdays, anniversaries, fundraisers, holiday parties, luaus, seminars, medical lunches, graduations, proms, yacht parties, school and church functions, etc. Michael is a single father and has two children, Tianna, 9, and Michael, 5 and they live in Dunedin. He enjoys coaching his son’s T Ball team and is an All Pro Dads captain at their school in Palm Harbor. To learn more about Amici’s Catered Cuisine please give them a call at 813-855-1100 or 727-447-1600 or visit their website at www.amiciscatering.com.